Definition and Summary: The 1921 Washington Conference were international talks held between 12 November 1921 and 6 February 1922. President Warren Harding called an international disarmament meeting inviting representatives from 8 major countries of Great Britain, Italy, France, the Netherlands, Portugal, Belgium, China and Japan to join the United States to discuss Naval disarmament and slow down the arms race. The meeting was hailed as a great success and led to three major treaties - Four-Power Treaty, Five-Power Treaty and the Nine-Power Treaty. 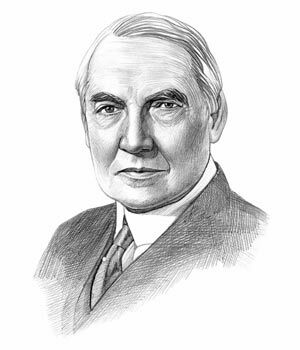 Warren Harding was the 29th American President who served in office from March 4, 1921 to August 2, 1923. One of the important events during his presidency was the 1921 Washington Conference. Fast, fun facts and Frequently Asked Questions (FAQ's) about the 1921 Washington Conference for kids. What was the Washington Conference of 1921? The 1921 Washington Conference was a military conference called by United States President Warren G. Harding that resulted in three major treaties: the Four-Power Treaty, Five-Power Treaty and the Nine-Power Treaty. What were the accomplishments of the Washington Conference? The accomplishments of the Washington Conference were far reaching agreements on naval armaments to slow down the naval arms race. 1921 Washington Conference Fact 1: Despite the terrible experiences and economic hardships caused by WW1 (28 July, 1914 - 11 November, 1918) the major powers in Europe were involved in a naval arms race. 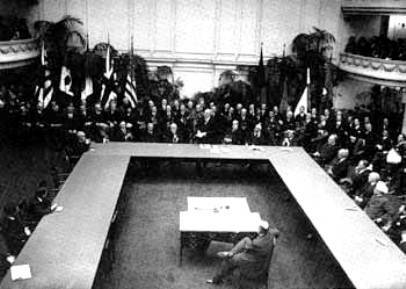 1921 Washington Conference Fact 2: The United States of America intervened by arranging the Washington Conference. President Warren Harding called an international disarmament meeting inviting representatives from eight major countries of Great Britain, Italy, France, the Netherlands, Portugal, Belgium, China and Japan. 1921 Washington Conference Fact 3: The lengthy talks were held between 12 November 1921 and 6 February 1922 to discuss disarmament and slow down the arms race. 1921 Washington Conference Fact 4: The United States Secretary of State, Charles Evan Hughes (1962-1948) served as chairman of the Washington Conference. 1921 Washington Conference Fact 5: In his address to the delegates he proposed a ten year moratorium (pause) on the construction of large new warships. Charles Evan Hughes went on to propose a list of existing battleships in each of the attending countries that should be destroyed - starting with American warships. 1921 Washington Conference Fact 6: The delegates were highly motivated by the opening address and went on to discuss disarmaments and produced three agreements, or pacts, in an effort to slow down the arms race and reduce the risk of future wars - the Four-Power Treaty, the Five-Power Treaty and the Nine-Power Treaty. 1921 Washington Conference Fact 10: The major weakness of the Washington Conference was that it did nothing to limit land forces. than either Great Britain or the United States. The article on the 1921 Washington Conference provides detailed facts and a summary of one of the important events during his presidential term in office. The following Warren Harding video will give you additional important facts and dates about the political events experienced by the 29th American President whose presidency spanned from March 4, 1921 to August 2, 1923.